Late night in the shed tonight. Over the last few days, I’ve cut the groove for the top panel, gotten the side slats all roughed out and half of them have had the tenons cut and the curved upright has had the mortices cut in it. Then I discovered I’d matched the wrong side’s slats to the curved upright. I don’t think it’s fatal, but I’ll have to reassemble things for the tweaking needed. This was annoying, so I decided to switch tasks a bit for the rest of this evening, and I finish planed the frame and panel for the back panel and drilled the joints for drawbore pins (I have the drawbore pins riven but not yet shaped; seemed rude to be driving pins through a plate after 2300h). And then I put some shellac on the walnut frame bits (the panel only gets osmo, so that happens when the entire thing gets osmo). 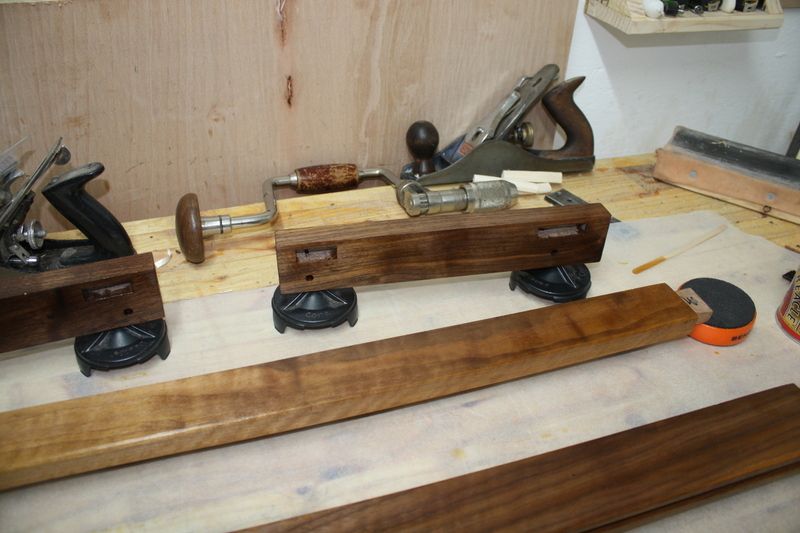 I also rounded over the corners with the spokeshave. So by the end of this weekend, I’ll have at least one part of this thing assembled and partially finished. It doesn’t look terrible. It’ll look better after a few more coats of shellac though.